Last Chance to Win VIP Tickets and See Ariana Grande this Aug. 23! Dying to watch Ariana next week but don’t have tickets yet? Well, here’s your last chance to win VIP tickets to catch her live this August 23! Thanks Spinnr for the awesome surprise! Let’s do this Arianators! Follow @SpinnrPH now and join #SpinnrArianaGrande! This is the part where we break free!!! Get pumped up for Ariana’s concert by listening to it on Spinnr now! Get the full mechanics on how to join/win on SpinnrPh in IG or Twitter! 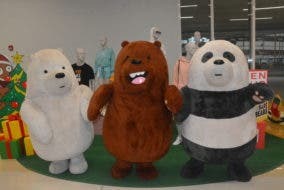 We Met We Bare Bears at the Mall, and They Were So Cute!